A number of prominent conservationists have recently been quoted in support of nuclear power as a way of decreasing greenhouse emissions. The gravity of the situation is undoubted, but it has led people to grasp at flawed solutions. In fact the greenhouse card can be seen as the last gasp of a dying industry which in the first decade of the century added only as much extra generation as Spain and Germany added in wind power in the single year 2004.Ã¢â€ Â©. The situation is in fact extremely difficult to untangle. Big power generation projects of all kinds involve so much money that everyone with a vested interest commissions reports which show that their approach is the only one which makes sense. An analysis of 10 recent studies shows a range of generating costs from 3 cents (all costs will be in approximate US cents per kWhour adjusted to 2004 figures) to 10 cents, with the best regarded study (MIT) giving a cost of about 7 cents. This same study estimates the cost of coal or gas generation at 4.2 cents. But these figures obscure so many assumptions that they are almost meaningless. It’s such a big topic that I’ve simply listed the basic costing difficulties at the end of the article, and then picked a number to be going on with. In any sensible discussion of a huge capital project, one would pick a conservative number, say 8 or 10 cents, but the nuclear industry has never accepted this (and their cost estimates have therefore always been wildly optimistic) so let’s choose 7 cents for the sake of argument. Delivery costs are about 2.8 cents, giving a total of about 10 cents per delivered kWh. Coal and gas generation begins at 4.2 cents, or about 7 cents delivered, but with credible carbon tax figures included, the delivered cost is similar to that of nuclear power, around 10 cents per delivered kWh. The best Uranium based designs are the new pebble bed systems which promise the ability to rapidly change power output to meet demand as well as effective passive safety systems. Thorium fuelled systems which are based around a neutron beam produced by a particle accelerator are potentially even safer and may produce less waste with a shorter half life as well as being less of a proliferation risk for nuclear weapons. It is at this stage an experimental technology and none have yet been built, but such Thorium based neutron amplification reactors are likely be more expensive because of their increased complexity. There is some argument as to whether their advantages over Pebble Bed systems are sufficient to justify development costs. To others such reactors answer all concerns about nuclear power. For the proponents of nuclear power, especially the scientists worried about global warming, this is the end of the discussion. We have the technology, we can rebuild. Pebble bed or thorium reactors appear to present no risk of meltdown, although there could be a Sellafield “Beach” style coolant leak (the safety record of Sellafield is sobering, by the way). Thorium reactors in particular deal with much lower levels of radiation and make waste disposal more practical, assuming that they turn out to be technically feasible. So what’s wrong with this picture? In fact it’s completely bogus. Nuclear power is presented as an alternative to coal or gas generation, and it stacks up equal or slightly better than the cost of such power plus the cost of cleaning it up (whether by the mythical carbon sequestration or the dubious reforestation methods, but that’s another story). Which is all a distraction from the real story. Nuclear power is expensive and slow to bring on line. Renewable, co-generation, and end-use efficiency measures vary in cost between cheaper and vastly cheaper per power unit, and can be deployed almost instantly. Proponents of nuclear power dismiss these methods as being of “minor application” and hamstrung by the fact that “the wind doesn’t blow all the time.” The real problem is that the most effective of these methods are small-scale on-site projects which don’t attract the big-industry lobbyists and power-brokers. building scale: 2 cents to 7 cents. End use efficiency: around 0 cents if well optimised; up to 5 cents for sub-optimal installations. An example: Adelaide, in Australia, is a city with a good climate for solar. A pilot study is fitting 10000 homes with roof mounted solar panels at no up front cost to the owner. Mass purchasing and good design lowers the cost to 50% of normal. Banks have agreed to bring the cost into the mortgages, paid off by the electricity savings. Surplus power is sold back into the grid automatically, which is very effective for the power utility as peak usage (for air conditioners) correspond with peak solar generation, which is about 1 kW per home. The panels pay for themselves, including interest, in about half of their (conservatively) 15 year lifetime, so the home owners, for no upfront cost, get seven or eight years of power savings, and the city avoids having to build it’s most cost-ineffective peak load generators. It’s disingenuous to dismiss alternative power as an expensive joke that’s useless when the wind’s not blowing. Cogeneration, for example, directly targets peak usage, as do efficiency and building scale projects. Wind and solar will never provide all a region’s power needs except in the most extreme climates, but this does not make them useless. The wind power cost used above (7 cents) includes a conservative firming and integration cost. A mix of power sources and targets is an advantage in providing baseline and peak power requirements, and there are an enormous number of renewable options, including wind, biomass generation, solar thermal, rooftop solar, geothermal, mini-hydro, biogas digester, and so on. In addition there are as many efficiency and co-generation methods. Many of these techniques are expensive compared with our 10 cent baseline, but they may still be viable because they reach off grid consumers, especially in the third world, or because they are individual scale and therefore compete with the retail cost of power rather than with the production cost. Each approach comes with its own disadvantages as well. Most projects, even on a small scale, must take local ecology into account in their planning; manufacturing processes may create greenhouse gases (this is true especially of solar panels and the construction and decommissioning of nuclear plants, as well as the methane production caused by hydro schemes submerging organic matter); wind, nuclear and other schemes may be best situated away from population centres. There is no substitute for careful and sensitive planning, keeping a range of options open. What is not a problem is scale. Nuclear power advocates often claim that only nuclear can provide sufficient total generation. In fact as Lovins notes, the diversity of renewable and demand-side power solutions in total far outstrip requirements. An illuminating illustration of the speed of a diverse portfolio of short-lead-time technologies installed by diverse actors in an open market occurred in California during 1982-85, [...] These [renewable] contracts and offers totaled 144% of the 1984 peak load, exceeding forecast load growth through the end of the implementation period. Had bidding not been suspended in April 1985 because of the resulting power glut, another year or so of acquisitions at that pace could have displaced every thermal station in California – which in hindsight could have been valuable. There may be a place for nuclear power generation in the west, although I’m sceptical of its economics and the motives of its proponents, but it has nothing to do with greenhouse. This is most importantly because it is too slow and too expensive to be of much help. It ties up an enormous amount of capital which could be used more effectively in other systems, and does not produce any power for at least 5 years of planning and construction. It’s been estimated that adding 700GWe capacity worldwide (tripling current nuclear generation) would require a $1 to $2 trillion investment and cut global temperature rise by 0.2 degrees Celsius. The point is that this same money would be more effectively directed elsewhere, especially efficiency, cogeneration, and biofuels. Not only is hugely more power created or saved for the same cost, but it’s online significantly faster. The nuclear industry has benefited from enormous subsidies over the last 50 years worldwide. If research and development costs are included it may be the biggest white elephant the world has ever purchased, not counting armaments. What should be a mature technology is still uneconomic and it’s time to stop throwing more money at a bad idea. Renewable and efficiency solutions are already viable, and with some research focus and an insistence on the fossil fuel generators paying for their greenhouse costs, we could be making progress in this area. The climate scientists and conservationists who have unwisely jumped on the nuclear bandwagon are right about one thing – we need to be fixing this now. 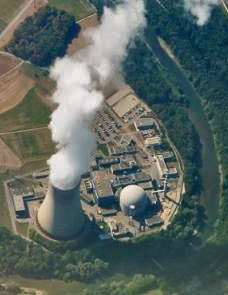 Appendix: Costing assumptions and difficulties for nuclear generation. About two thirds of the cost of a nuclear power plant is the capital and interest costs of construction and decommissioning. Maintenance and repair make up the majority of the running cost, with fuel a smaller expense. Few reliable figures are available for construction cost. Historical costs have usually overrun greatly, like most large projects which involve a large amount of on site engineering. The World Bank will not lend money for nuclear generation projects for this reason in particular. The recent Finnish plant was projected at $2200/kW but will probably cost more, nevertheless the MIT study assumed $2000/kW. Increased safety and regulatory requirements have led to successive generators being more expensive than their predecessors. The lifetime of the reactor. Studies use anywhere from 25 to 60 years, and the MIT study used 25 or 40 years: we have chosen the 40 year value. It is true that the latest technology plants have design lifetimes of 60 years, but since commercial loans must be repaid over no more than 15-20 years there is no immediate benefit to capital cost. Cost of capital. This is a minefield beyond my experience. Governments have often provided guarantees which have amounted to a subsidy of this cost. Subsidies hidden in costings. Many subsidies have historically applied to the nuclear industry, and they greatly distort some figures. For example accident liability caps in the US and elsewhere have a direct effect on insurance costs, and the nuclear industry would almost certainly be uninsurable without them. Future technology. Expectation of future advances in waste treatment reactor decommissioning methods are built into most nuclear costing. These expectations may be reasonable, but they are usually excluded from costing of other energy sources. Construction time. Time overruns are even more extreme than cost overruns. Most studies estimate construction time at 5 years, and some envisage this reducing to 4 years as more plants are built.